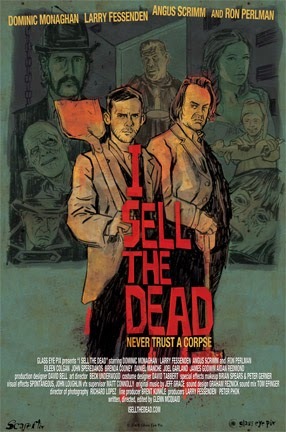 I Sell the Dead stars Dominic Monaghan (the ‘Lost’ hobbit), Angus Scrimm (the tall man from Phantasm RIP) and Ron Perlman (the ugliest man in Hollywood), that’s some movie pedigree there. This movie can’t be bad, right? Monaghan stars as a grave-robber in the employ of Scrimm, who does some unknown experiments on the cadavers brought to him. The movie starts with Dominic having been arrested and sentenced to death. Just prior to his execution, he makes a confession to a priest, played by Perlman. The majority of the movie is Dominic recounting his career as a grave-robber and how he was initiated into this life. It was at this time that I learned this isn’t a horror movie, as its billing had led me to believe. I Sell the Dead is a comedy based around horror themes. 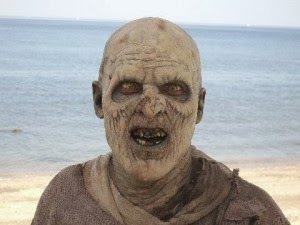 Not too long into the movie, vampires are introduced as a real thing. This opens the door for other supernatural creatures to appear, and appear they do. These types of special cadavers are worth more than regular humans, and soon Dominic and his sometime partner/mentor/boss begin specializing in the retrieval of supernatural corpses, because if you’re going to sell the dead, you may as well make more doing it. Things go to hell when Dominic brings on an apprentice of his own, who also happens to be a woman. (He should know better. Has he never seen movies before?). She convinces Dominic (and by extension his partner) to take a dangerous job they normally would steer clear of. This job is too dangerous for them, which is supposed to be a big deal because we’ve already seen them rob graves. But really, the movie didn’t do enough to explain why this would be dangerous. The rest plays out exactly as you would expect. They go to an island to retrieve a corpse, the new apprentice dies in the process, Dominic and Angus get arrested, and we’re right back to the beginning of the movie. If this had been a review for a comedy, it may have a more valued position in the annals of macabre movie history (maybe), but as it stands, for a horror movie, it definitely doesn’t deserve much recognition in the cemetery. The best thing going for the movie is the fact that they never take themselves too seriously. There’s a scene where Dominic and his partner continuously scare each other by pulling the steak from a vampire’s chest, inadvertently resurrecting it, only to stab it again, re-killing the vampire, and repeating this process several times. It’s in these comedic scenes that the movie shines. Actually, “shines” might be too generous of a word.